Halifax registered their third draw of the season in Yorkshire Three in an exhilarating game against Castleford at Ovenden Park which finished 26-26. Thrashed 60-5 at Old Otliensians the previous week, the bottom side showed much better concentration, enthusiasm and application against mid-table rivals in excellent conditions for open rugby. Cas looked the more fluent side in the three quarters but Halifax made good ground through Ben Mather and Zak White in midfield. The hosts lost ruck ball when mounting pressure through their eventually dominant forwards. Halifax’s improved tackling up front was evident early on but they could do little about Cas’s first score when a magnificent long pass put the left winger in the clear. An equally fine conversion followed. Halifax replied well with good handling. Chris Dennison put a penalty attempt wide and Tony Curtis was held close to the try line after supporting Mather’s strong break. Reward for Halifax’s efforts came when Cas lost the ball on their own line and centre White was sharp to pick up and score. Dennison converted for 7—7. They were on terms for only a short time. 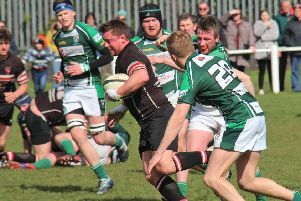 The referee ruled that they had palmed the ball over their own dead ball line to save a try. A penalty try was awarded and a yellow card issued. The 14-7 interval deficit was stretched to 26-7 when Cas used their three quarter skills to good effect. Halifax looked out of it but responded in splendid style with their forwards in charge. With 20 minutes to go, new signing fly half James McKibbin forced his way over. Curtis drove over under the posts, with a Cas player in the sin-bin, and Dennison’s kick made it 19—26. Halifax were battering the line constantly and when the driving home forwards were brought down illegally another penalty try was given. Dennison’s conversion brought the scores level. Curtis was forced into touch 10 metres short as Halifax pressed to the final whistle, Cas being relieved to hang on for a draw.